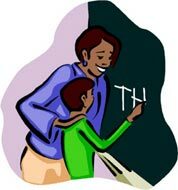 1 What would we do without teachers? Teachers are community helpers. Their job is to help us learn. Teachers work at schools. Some schools are for children. Other schools are for adults. 2 Men and women both train to be teachers. Your teacher went to college to learn to teach. She studied hard. It took a long time to learn to be a teacher. She needed to learn how to teach reading and math. She also learned about science, history, and grammar. She learned how to teach a class full of children. Now she can help you understand.